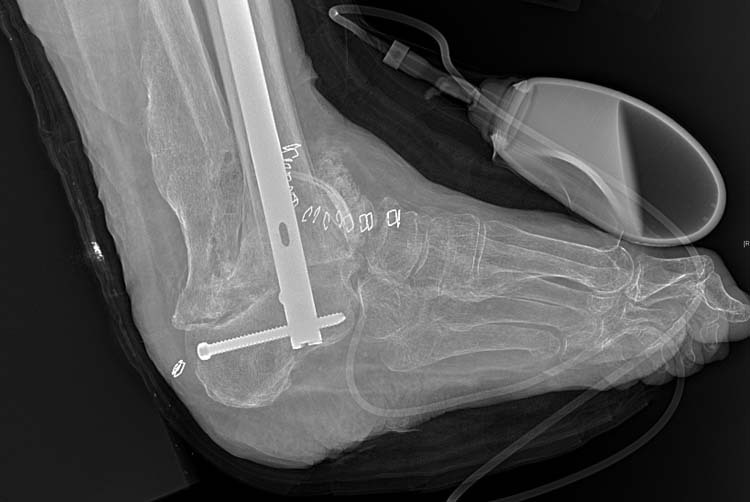 Tibiotalocalcaneal/Tibiocalcaneal arthrodesis with intramedullary nail fixation is a useful and stable means through which to address complex rearfoot deformities. In this manuscript, we have critically analyzed the modalities and surgical outcomes within existing literature comparing each to our institutional results and have found a critical void in information. In tracking and addressing variables such as smoking cessation, glucose control, weight management, vascular stability, extremity ulcerations and postoperative pedorthics we have observed improved operative outcomes and fusion rates. In reviewing the literature, we have found bone union rates of 79.6%, non-union rates of 7.6%, fracture rates of 1.4% and amputation rates of 4.7%. Those results were then compared to our rates of 88.88%, 11.12%, 0% and 0% respectively. Yet, while our institution noted improved results, a meaningful meta-analysis was difficult to achieve considering that most literature failed to make note of the aforementioned variables. Accordingly, we offer that a strict preoperative regimen of glycemic control, vascular patency, weight management and smoking cessation, in conjunction with strict postoperative non-weight bearing and aggressive wound management will improve overall results. Furthermore, it is our suggestion that future research address these topics. Charcot neuropathic osteoarthropathy is a destructive disease of neurologic origin that contributes to both bone and joint abnormalities. While its pathogenesis is not completely understood, the Charcot process is thought to be a product of neurovascular and neurotraumatic etiologies with effects reaching far beyond the diabetic community. In examining the Charcot limb it is important to understand that this deformity will typically present in three anatomic planes–the sagittal, transverse and frontal. The effects of that triplanar deformity are most notable in the Charcot ankle, with severe valgus or varus fixed deformities or occasionally “flail” ankles with the foot being stabilized on the lower extremity by soft tissue alone [1,2]. Figure 1 3-D computed tomography reconstruction of patient 1. 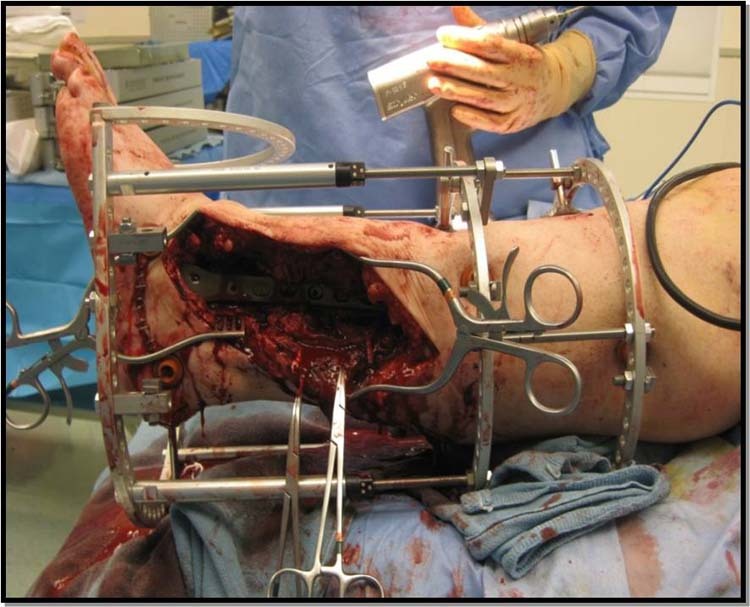 Often, patients also experience postural changes and a grossly unstable bony architecture presenting the need for aggressive surgical correction [3-6]. With that, one mainstay of therapy remains rearfoot fusion with intramedullary nail fixation [2,7]. It is expected that anywhere from 0.1 to 5% of all diabetic patients will develop neuropathic osteoarthropathy during the course of their disease; these odds are increased substantially in patients with end-stage neuropathy [3,4,8-10]. 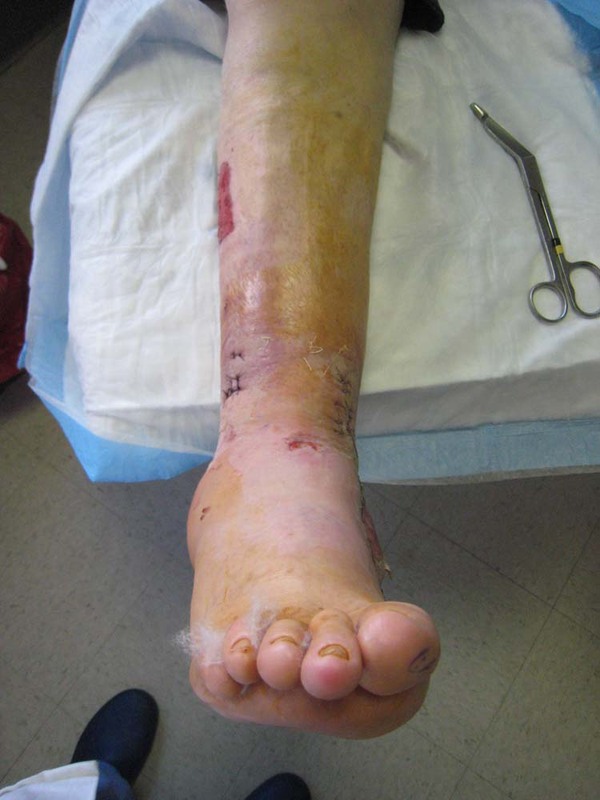 Moreover, diabetic patients with ulcerations are significantly more likely to undergo extremity amputation. With these odds, it is extremely important for the foot and ankle specialist to judiciously approach the Charcot joint. Our study evaluates the results of bone fusion rates and outcomes with tibiotalocalcaneal/tibiocalcaneal arthrodesis. In order to accomplish this, we have explored our institutions outcomes alongside those of existing literature to demonstrate commonalities and techniques for successful treatment and/or interventional modalities. To this end, it is our hypothesis that meticulous preoperative planning, intraoperative techniques, and post-operative care significantly affect the success of the fusion rates. Figure 2 Post-operative radiograph of patient 1. An extensive literature review of selected electronic databases including PubMed, the Cochrane Database and OVID was conducted for articles using the key words “Charcot ankle”, “intramedullary nail”, and varied combinations of each. No specific time parameters were set; accordingly, articles were reviewed from inception to present. Studies were excluded if they were not available in English, did not address the use of intramedullary nail fixation for the diabetic Charcot ankle deformity or did not note postoperative weight-bearing, obesity, wound care or union type. With that, only thirteen articles were found to meet our inclusion criteria. (It should be noted that our original inclusion criteria included monitoring of blood glucose levels, nutritional status, vascular stability and nicotine use, however literature that followed these variables was extremely limited). Secondarily, a review of our senior authors (B.B.) patient database was conducted. 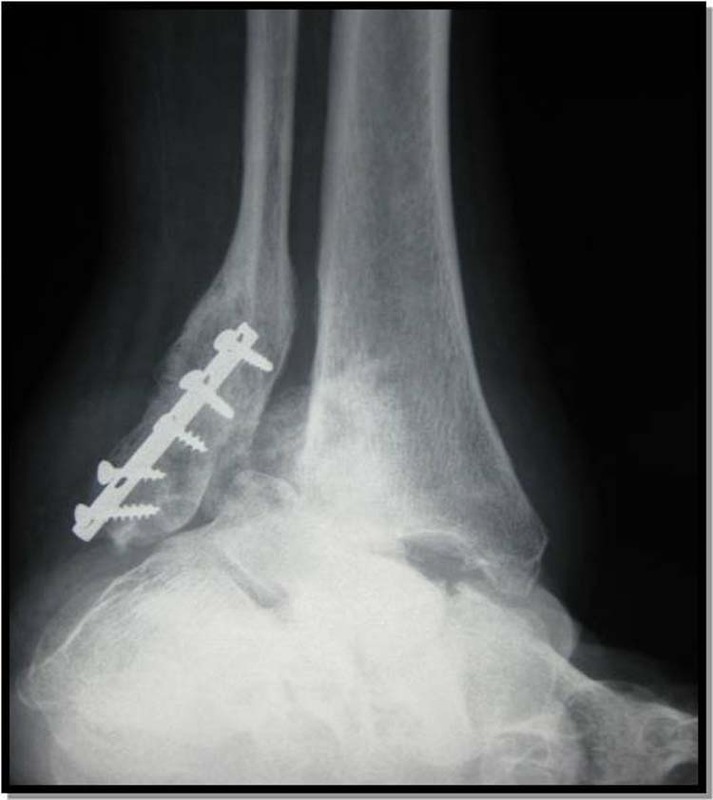 Nine consecutive patients who had undergone tibiotalocalcaneal/tibiocalcaneal arthrodesis using an intramedullary nail between January of 2005 and 2009 were selected for review. Perioperative data was obtained from our institutions electronic medical record system and wound care facility records. Figure 3 Pre-reduction radiograph of patient 2. Of the nine patients followed within our institution, eight were diagnosed with a Sanders IV Charcot deformity, seven had a medical history significant for diabetes mellitus, and seven weighed over 102kg. The average patient age was fifty-five years with eight males and one female. All diabetics demonstrated a hemoglobin A1c of less than 7.5%. Stable lower extremity arterial studies as per our institutions vascular surgeons were noted along with dopplerable pedal pulses. All patients had also transitioned from the active phase of neuroarthropathy to the chronic phase as demonstrated by cutaneous infrared thermistor readings being equalized to within 2 degree Celsius of the contralateral unaffected limb [11,12]. Figure 4 Post-operative radiograph of patient 2. Patients who demonstrated active “hot” joints were managed pre-operatively with protected weightbearing in total contact casts with adjunctive therapy of oral or parenteral bisphosphonates or miacalcin nasal spray and/or non-invasive bone stimulation therapy until temperature readings equalized and edema had resolved. Patients from our senior author’s practice were refused surgical intervention if at the time of surgery they 1- had an open wound, 2-had not accomplished pre-operative glycemic control, 3- had not undergone tobacco cessation, 4-had not attempted weight management or 5- did not have adequate vascular runoff/perfusion as determined by our facilities vascular testing (ABI/PVR) (Table 1). Post-operatively, our patients were kept strict non-weight bearing until clinical stability was noted. At that time they were transitioned into a total contact cast and finally, as consolidation completed, to accommodative shoe gear or custom-fabricated ankle-foot orthosis. All patients were followed postoperatively at our facility’s wound care center for weekly appointments until that time when independence and function had been restored. Additionally, all post operative wounds were treated at that same facility by certified wound care specialists until the time of their resolution. A hockey stick type incision was made over the fibula and curved distally to the level of the sinus tarsi at the base of the fourth metatarsal. The fibula was then exposed and the distal aspect of the fibula was resected. 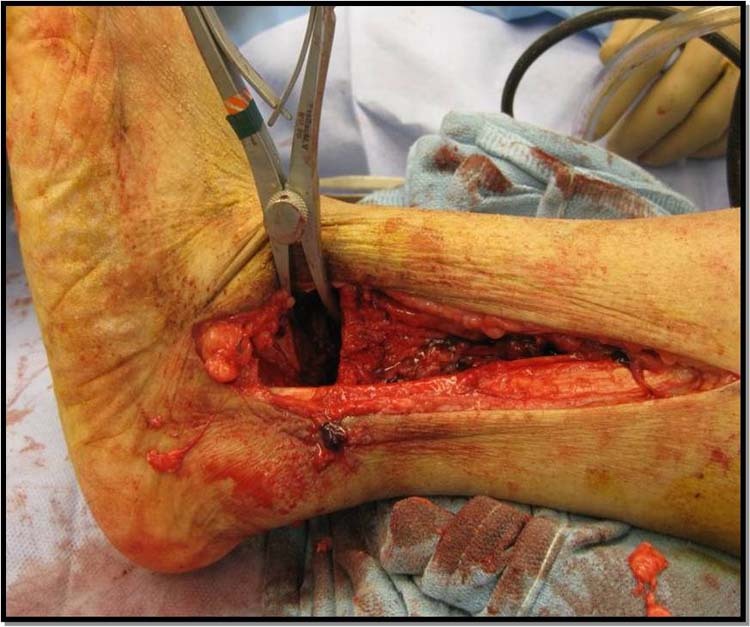 Typically, the fibula was morselized to be incorporated as bone graft material to fill osseous deficits. 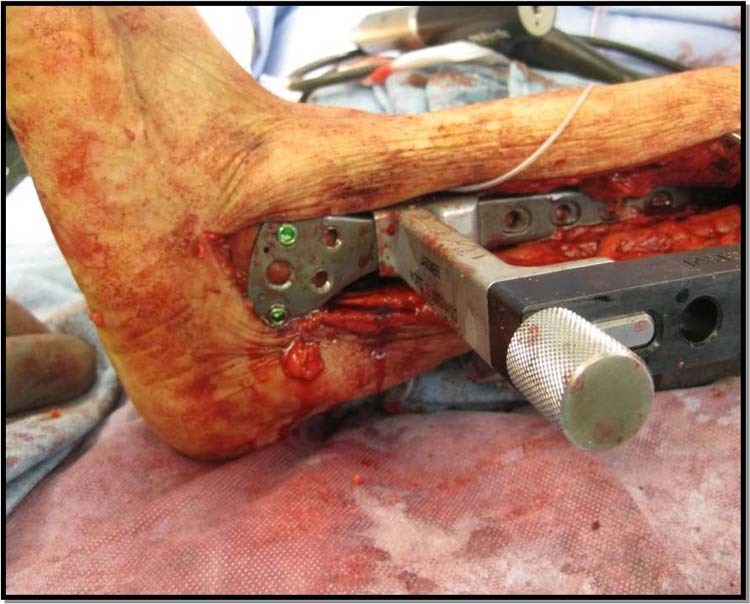 An accessory medial ankle incision allowed adequate debridement of devitalized talus and preparation of the joint surfaces. Standard technique included a talectomy and insertion of a wedged portion of bone (autograft from the talectomy or fresh frozen femur) to allow the tibia to seat at 90 degrees to the weightbearing surface in contact with the posterior facet of the calcaneus. All opposing surfaces of tibia, calcaneus and navicular were denuded of cartilage and multiple subchondral drill holes were created through their articulating surfaces. Additionally, the anterior tibia and bone graft wedge were similarly fenestrated to facilitate bony fusion. 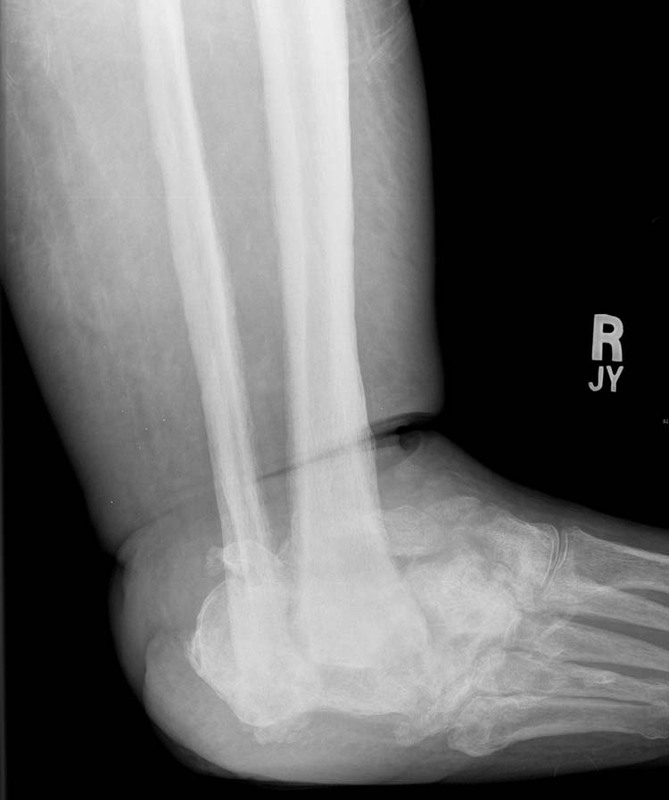 All deficits were back-filled with the morselized fibula graft. Frequently, the Achilles tendon was released at this time. The foot was then assessed for proper positioning and placement of the IM nail. At that time, the guidewire for the nail was placed within the anterior aspect of the plantar heel through the talus–centered into the medullary canal of the tibia. That was then confirmed by intraoperative C-arm guidance in AP, and lateral positions. The bone was drilled, reamed, and placement of the nail was performed utilizing the systems jig. 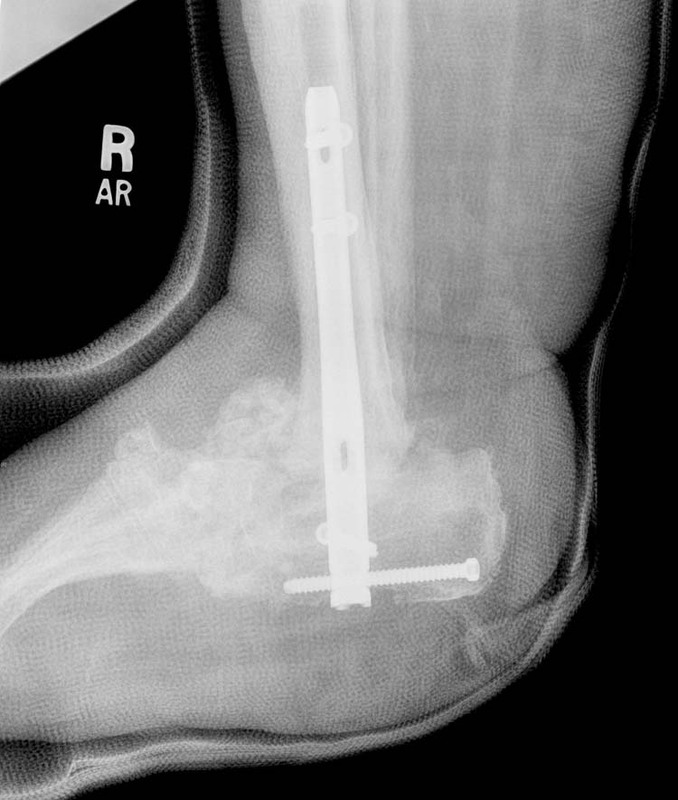 Depending on the system utilized, compression was achieved across the arthrodesis site either externally with tightening of the jig/”top hat” against the external heel pad or plantar calcaneus, via manual compression of the heel, internally through the compression bolts, or externally via external fixation bolts incorporated on the jig. Following insertion of compression screws to fix the nail to the osseous structures, the jig was removed and the IM nail was visualized by C-arm for positioning. Subcutaneous structures were closed with 3.0 vicryl and the skin with staples (Table 2). The incisions were covered with Xeroform™ and a Robert Jones compression dressing. Postoperatively the patient was placed on bedrest with ice, elevation and subcutaneous low molecular weight heparin (Table 3). Osseous fusion, defined as trabecular bridging at the fusion site with disappearance of appositional gapping, was noted in 88.8% of all patients within our institution. 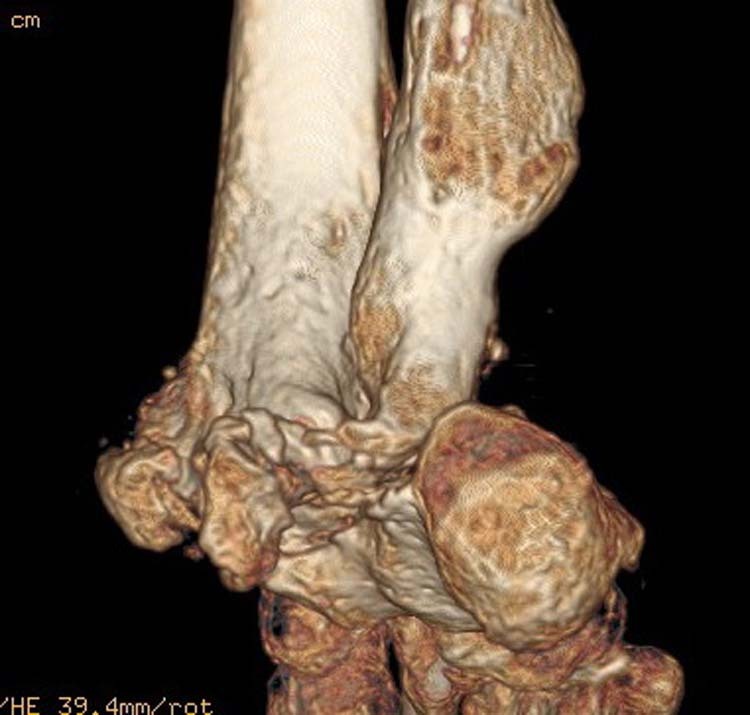 Categorically, fusion was seen in 85.7% of diabetics, 87.5% of Charcot limbs, 85.7% of those weighing over 102kg and 88.8% of those placed in a postoperative TCC. Figure 5 Pre-reduction clinical image of patient 3. Comparatively, literature has demonstrated fusion rates of 73%, 70.4%, 92.4% and 46.2% respectively [2-4,7,8,13-20]. Moreover, our institution demonstrated significantly fewer post-operative complications when compared to published literature 11.12% non-unions, no amputations and no osseous fractures. Somewhat skewed, however, is the above average number of post-operative wounds encountered within our institution 44.4% as opposed to 18% in literature. Although that statistic could certainly be secondary to the extent of deformity or aggressive tracking, it is hard to draw any correlations due to the lack of detailed information with those articles reviewed. 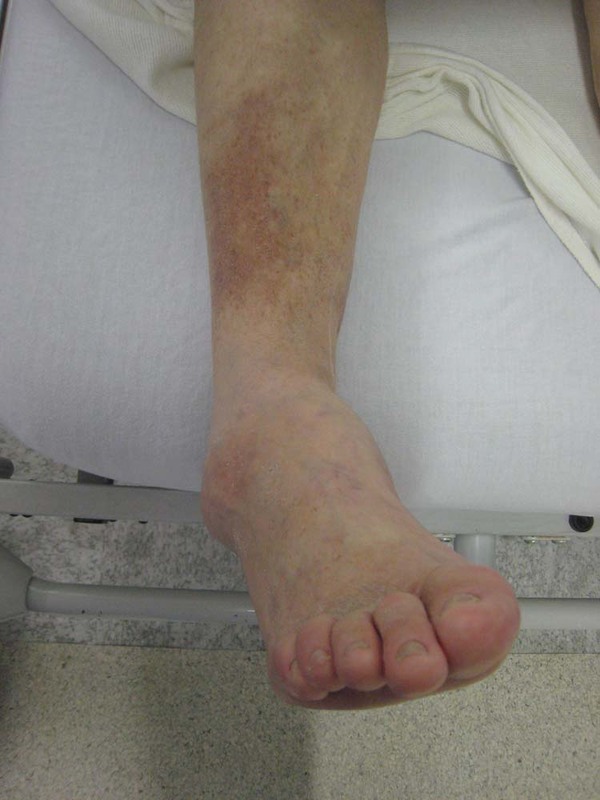 Figure 6 Post-reduction clinical image of patient 3. In recent years indications for tibiotalocalcaneal/tibiocalcaneal fusion have expanded, likely because of improved fixation methods . Intramedullary fixation is biomechanically more rigid than crossed lag screws when examining flexion and torsional forces . Accordingly, retrograde intramedullary nailing is a good option for complex tibiotalocalcaneal/tibiocalcaneal fusions, especially in patients with Charcot arthropathy [21-24]. The construct does allow for weightbearing six to eight weeks after surgery while demonstrating fusion rates that approach ninety percent. As with any surgical patient, a thorough preoperative assessment should be performed. It is essential to consider the entire patient and not simply the deformity. Therefore, a complete physical examination and adequate overall health evaluation is essential to choose an appropriate surgical candidate. In this small retrospective analysis, we propose that the following reasons could account for our improved fusion rate. First, critical preoperative planning, including thorough evaluation of the osseous deformity with a 3-D 64 slice CT scan and long-leg axial radiographs. Second, all patients were followed-up at our institutions wound management center to facilitate aggressive management of pre-operative and post-operative wound complications. Third, evaluation of the patient’s vascular status with non-invasive arterial testing such as toe pressures, ankle/brachial indices and arterial Doppler examination during preoperative evaluation proved to be invaluable when determining inclusion criteria. Fourth, patients were offered enrollment in weight loss and smoking cessation programs preoperatively, deferring surgery until this occurred. 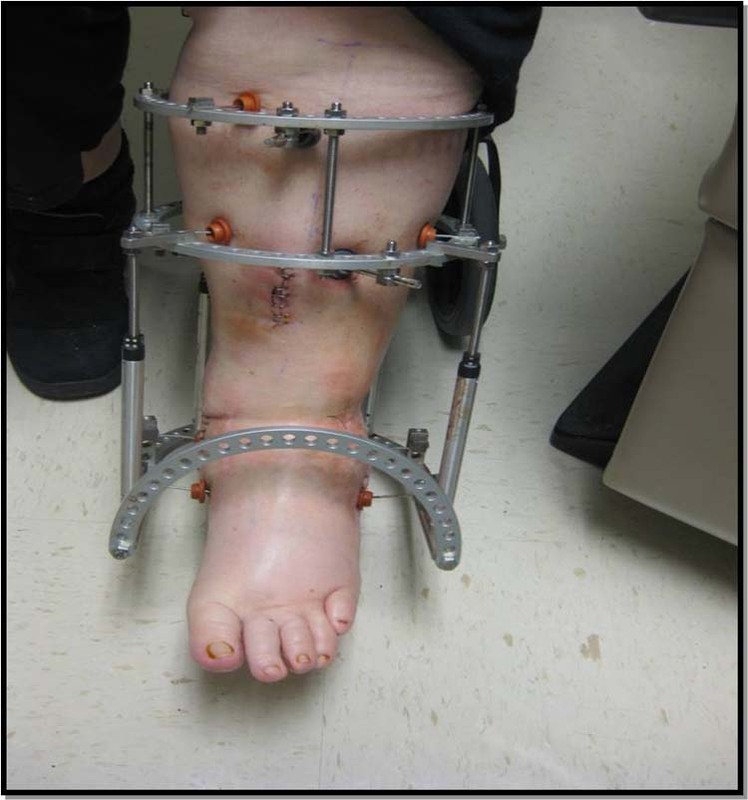 Fifth, physical therapy training preoperatively and strict non-weight-bearing postoperatively was maintained for eight weeks after which total contact casting and finally bracing was applied. Sixth, nutritional factors were medically evaluated and patients were under firm metabolic control. Overall, in reviewing the data offered in our literature review and that of institutional review, it is difficult to do a successful and meaningful meta-analysis given the overall lack of detailed patient information and differentiation. Most publications made little mention of preoperative variables that our authors found exceedingly important to track ABI/PVR, weight management, extent of diabetic control, preoperative wound/deformity, tobacco use, etc. In that void, as previously noted, the authors of this study were required to exclude a majority of papers found. Within the grouping of useful studies (Table 1), patient results were taken individually for correlation accounting for the varying cohort numbers (n=). Meaning, each variable along the x-axis consists of a compilation of data collected from different publications. Accordingly, it is an imperative that future studies more closely follow and account for those variables. This study demonstrates that, while great strides are being made in the world of reconstructive surgery for neuropathic osteoarthropathy, there remains a void in critical information. 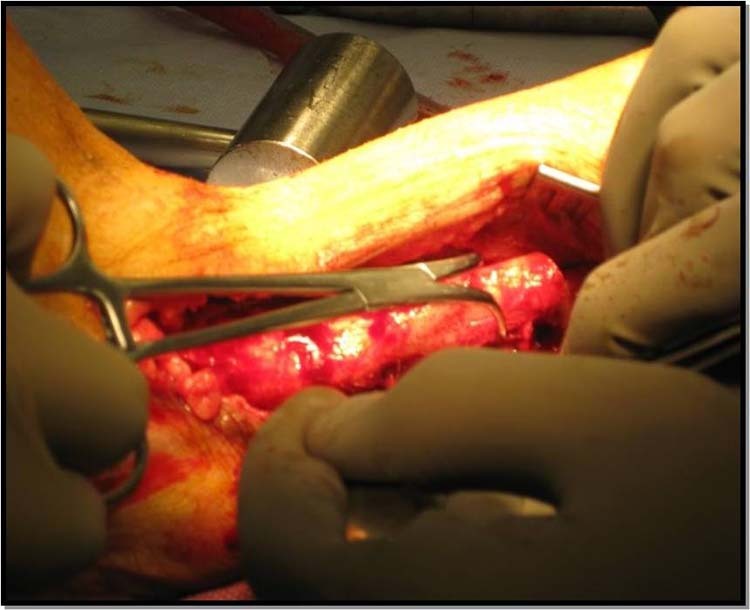 Information that will not only lead to better standards in surgical management, but also to a more detailed understanding of the Charcot limb and improved techniques in limb salvage. 6. Wagner FWW. The Diabetic Foot and Amputations of the Foot. Surgery of the Foot, 5th Ed. Mann, PR (ed. ), St. Louis, CV Mosby, 421-455, 1986. 10. Sanders LJ, Mrdjenovich D. Anatomical pattern of bone and joint destruction in neuropathic diabetes. Diabetes 1991 40 (suppl 1): 529A. 11. Eichenholtz SN. Charcot Joint. Charles Thomas, Springfield, IL, 1996. 12. Sanders LJ, Frykberg RG. Diabetic Neuropathic Osteoarthropathy: The Charcot Foot. The High Risk Foot in Diabetes Mellitus. Churchill Livingstone, New York, 1991.